Have I mentioned how much I love Wellness® grain-free dog food?! It’s truly the best pet food switch I’ve ever done. I enjoy giving my dogs options so they aren’t constantly eating the same thing. I know I wouldn’t want to eat the same food all the time. Wellness offers an entire line of grain free recipes that I can choose from to give Wynston variety, and it’s all available at PetSmart®! With that being said, going to PetSmart® and browsing the aisles with my boy is one of my favorite things to do. There are a plethora of Wellness choices to pick from and thankfully several of them are grain-free! It’s extremely convenient to be able to look at the wide array of product available at my preferred pet supplies store. Wynston just wants to eat all of the food! Wellness® grain-free Complete Health™ and Core® foods offer natural ingredients and pre/pro-biotics to provide your dog with a wholesome meal. I couldn’t be happier with the Core® grain-free small breed food that Wynston has been eating over the past two months. The tiny kibble triangles are made from turkey, chicken, salmon-oil and vegetables. There are no fillers, meat by-products, corn, soy or wheat-gluten. It’s also free of artificial colors, flavors and preservatives – it doesn’t get much better than that! Grain free Core is meant for dogs who have higher energy needs. We do a lot of hiking and agility for fun, so it’s the perfect food for Wynston. Core air dried dog recipes, which I LOVE using as a meal topper. Complete Health dry dog food recipes, which include ingredients like lamb, chicken and whitefish. Wynston has been especially active lately. In the past month I’ve noticed that on our nightly walks, he runs half the time. He’s even running at the park a lot more with Khloee and McKenzie Rae. I started to realize this change in activity about a month after we switched to Wellness® Core®. Wynston isn’t a senior dog, but he will be five years old in September. For small breeds, that’s still fairly young, but I want to do what I can to protect his body from going downhill. Core grain-free small breed formula has glucosamine and chondroitin to help maintain bone and joint health which is great for any dog. It’s important to me as a dog mom that I feed my pups a meal that’s made with the highest quality standards as well as the benefits that Wellness grain-free recipes offer. You all know how much I cherish PetSmart. I could go on and on about my love for the store but I will spare you…this time 😉 Wellness offers a grain-free option for every dog and every budget! I strongly encourage you to head to your nearest PetSmart to browse the Wellness section. As you can see from the photo above, the possibilities seem endless! PetSmart keeps their shelves clean and organized, making it easy to take a good look at all of the grain-free products made available to pet parents. 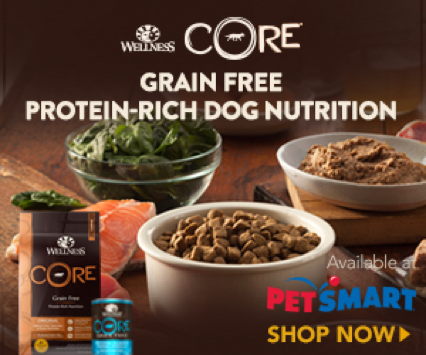 And get this, Wellness is offering $2.00 off their Core® dry dog food recipes at PetSmart stores during the month of June! “At Wellness®, we do whatever it takes to create the healthiest foods for the pets that depend on us.” As a dog mom I truly appreciate the fact that Wellness is looking to help sustain the good health of my pets. They prove this by offering dog food options that don’t have all the icky fillers and artificial ingredients. Our dogs and cats deserve long, healthy, happy lives and it’s up to us to provide that for them! Weekend plans? Take your dog to the nearest PetSmart and have some fun! I’d recommend browsing the massive selection of Wellness grain-free products. You can even do some research on PetSmart.com and look at all of the foods before you go to the store. Remember that Wellness offers a food for every dog on every budget, so I’d bet that you can find something fitting for your pampered pup. Plus, you can take advantage of the $2.00 savings on Wellness Core dry dog food recipes during the month of June! You can read more about our Wellness grain-free journey here! It’s been an absolutely phenomenal experience and I dare you to make the switch 😉 OH! And be sure to follow Wellness on Instagram and Facebook so you can share photos of your dog’s grain-free journey! Are your dogs or cats currently eating Wellness food? Have you thought about going grain-free? If you’re not feeding Wellness, would you consider making the switch? Ahahaha Wynston also loves and and I’m also fascinated by it! I love the idea of mixing things up and rotational feeding. We only recently started this with Ruby about six months ago and it’s working really well. We will absolutely use the coupon and check out Wellness Core Grain Free. Thanks! I love switching it up to add variety and it’s been working well. Core grain-free has been a game changer and we couldn’t recommend it enough! We switched Dexter to grain free when he was a puppy. He use to get such horrible allergies and stomach aches and we could never pin point why, until we switched his food. Dexter is so much happier being on Grain free it’s crazy how much difference changing your dogs diet can be. It’s wonderful that as pet parents we have so many healthy options for our dogs! It really is incredible to see how different ingredients can affect them. We’ll have to try the air dried food as a topper as well, I’m sure the crew would love it!